Milling, sometimes also known as fine grinding, pulverizing or comminution, is the process of reducing materials to a powder of fine or very fine size. It is distinct from crushing or granulation, which involves size reduction of a material to a smaller size. Milling is used to produce a variety of materials which either have end uses themselves or are raw materials or additives used in the manufacture of other products. A wide range of mills has been developed each for particular applications. Some types of mills can be used to grind a large variety of materials whereas others are used for certain specific grinding requirements. Material grinding is quite often an integral part of an industrial process, whether carried out on a large or small scale and in some cases the grinding mill may be the single most costly item for in the process of operation. Installing a grinding mill which is suitable for the purpose, is one of the main requirements for cost effective and trouble free processing of materials, if a grinding stage is involved. Most types of readily available hammer mills for agricultural grinding are not suitable for grinding of minerals. The characteristics of the material, which are to be taken into account during the selection of the grinding mill, are (i) hardness, (ii) brittleness, (iii) toughness, (iv) abrasiveness, (v) stickiness, (vi) softening and melting temperature, (vii) structure (e.g. close grained or cellular), (viii) specific gravity, (ix) free moisture content, (x) chemical stability, (xi) homogeneity, and (xii) purity. The hardness of a material is probably the most important characteristic to be considered when deciding on what type of mill to choose. Trying to grind a material which is too hard results either in costly damage to the mill or an expensive maintenance requirement. Generally for harder materials, specialized and expensive type of grinding mills are used. In addition if a particular mill can be used over a range of hardness scales, the harder the material the lower the throughput for a given size requirement. Another characteristic of a material that is to be known is the brittleness, which is the degree to which a material breaks easily. Most minerals are brittle, as opposed to metals which are ductile, although some to a greater degree than others. Brittleness does not equate with hardness as brittle materials can be hard or may not be hard. It is not easy to grind materials which are not brittle to some degree. In case of dry milling, free moisture content of the material is to be as low as possible. In practice, this can be a problem, especially in humid regions where the moisture can cause the material to stick to the grinding media. Different mills behave in different ways with moist materials and in some cases drying of the raw materials may be required. The final size of the material after grinding is important. Usually required degree of fineness is specified which is normally stipulated that a proportion of the material is finer than a particular size. Usually this is 90 % or 95 % but may be 99 % for particularly demanding application. Milling circuit – It can be either open or closed. The milling circuit is the complete mill system from beginning to end, which includes feed mechanism, mill, classifier, separator, product collector, etc. In a closed mill circuit, the oversize particles are returned from the post milling processes to be regrinding, while in an open circuit the process there is no feedback loop. Air classification – It is also known as pneumatic classification. It is sizing of particles using a mechanical air separator. Batch mills – These mills receive a discrete quantity of charge material which is ground and then discharged. The process is then repeated. Continuous mills – These mills accept a continuous flow of feedstock and hence can operate on a continuous basis. Both batch and continuous mills have their relative merits and demerits. Peripheral and trunnion discharge – For cylindrical mills which are continuously fed, the discharge of the ground product can be either through the periphery of the mill (peripheral discharge) or through the far end of the mill (trunnion discharge). Tumbling autogenous (AG) mills are drum mills which consist of horizontally rotating slightly inclined cylinders of large diameter and small length and fitted with lifting bars. Coarse feed is entering the mill from one end and outlet is at the other end. In the mill, the feedstock is lifted and then allowed to drop through a significant height. Three significant mechanisms cause the breakdown of the mineral. These are (i) impact due to the fall of the mineral onto the charge below causes a reduction in the size of the feedstock, (ii) attrition of smaller particles between larger grinding bodies. and (iii) abrasion or rubbing off of particles from the larger bodies. Steel or ceramic balls are often added to aid with the reduction process. In this case the mill is then referred to as a semi autogenous (SAG) mill. The process can be carried out wet or dry. Feed is grinded during its way through the mill. The mill is normally used for grinding of ores. Lining of the cylinder plays very important role. It protects the mill from abrasions and at the same time it helps in lifting of the material from the bottom of cylinder. The types of lining are (i) smooth liner, (ii) wave liner, (iii) ship lap liner, (iv) step liner, and (v) Osborn liner. Removal of the final product can be carried out using air (where the process is dry) removing only the fines. Rotational speed is usually fairly low, about 80 % of critical speed (critical speed is the speed at which the charge will be pinned to the rotating drum and does not drop) and typical drum diameter ranges from 2 to 10 meters. This type of mill is often used as a single stage process, providing sufficient size reduction in a single process. Alternatively, it can be part of a two stage process where further size reduction is required. This type of mill is only suited for those kind of ores which are of a fairly coarse nature, but once they are broken, they readily disintegrate into smaller sizes. Typically, this type of mill can produce a product with a fineness of less than 0.1 mm. Testing of materials is needed beforehand for determining the suitability of the ore for processing in an autogenous mill. This type of mill has a distinct advantage of accepting coarse input material and supplying a relatively fine ground product. This advantage can provide a reduction in the plant cost, since a single mill can be used as a substitute for two or more stages. There is little wear as the grinding is often carried out by the material itself. Autogenous mills are more suited to large installations i.e. more than 50 tons per hour and have a power requirement ranging from 40 kW up to hundreds of kW. This type of mill is only suited for those kinds of ores which are of a fairly coarse nature but once they are broken, disintegrate readily into small size. Typically this type of mill can deliver a product with a fineness of less than 0.1 mm. Testing of material is needed before hand to determine the suitability of the ore for processing in an autogenous mill. The rod mill (Fig 1) is a tumbling mill which is having a large percentage of its volume (30 % to 40 %) loaded with steel rods. The rods are placed axially in the mill and are loose and free to move within the mill. The internal lining of the drum has a series of lifters which raise the rods and drop them at a predetermined point. The liners prevent long and heavy rods to slide on the cylinder lining and help them to lift up. Because of the high kinetic energy of a dropping rod, it is important to pay attention to protecting the cylinder when choosing a liner for the mill. The material is fed in at one end with a maximum size of about 25 mm. The rods crush the material and as the charge passes through the mill, it is reduced in size to approximately 2 mm to 0.1 mm. The mill can be fed from one end with the product removed from the other end or, alternatively, the mill can be fed from both ends with the discharge at the centre. The process can be wet or dry but generally it is carried out wet. Maximum rod length is about 6 to 7 meters, otherwise there is a risk of the rods bowing. The drum diameter is limited to 0.6 or 0.7 times the length of the mill. Rod mills are used for grinding hard minerals. This type of mill is normally used as the first stage of a milling process to provide a reduced size feedstock for a further milling process. 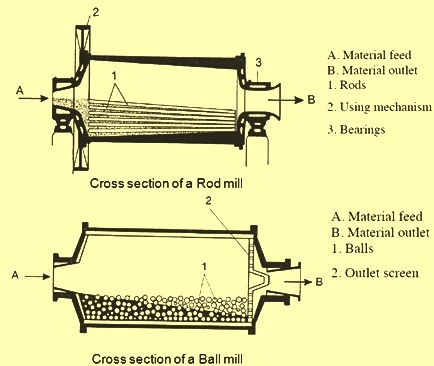 Ball mill (Fig 1) is same kind of mill as rod mill, except that it is filled with balls instead of rods. Because of balls have greater ratio of surface area than rods they are more suitable for fine grinding. Balls are also lighter, so the kinetic energy of a single dropping ball is smaller than a rod. The lining material is of great importance as there is a significant amount of wear taking place due to the action of the steel balls. The mill consists of a cylindrical drum, sometimes tapered at one end, and usually has a charge of steel balls (up to 40 % by volume) ranging in size up to 125 mm for larger mills. Product size can be as small as 0.005 mm, but product size is dependent upon the time the charge spends in the grinding zone and therefore the reduction rate is a function of the throughput. The speed of rotation is optimum at about 75 % of critical speed. Some mills are compartmentalized with each subsequent section having a smaller ball size. The material can pass through to the proceeding section, but the balls cannot. This ensures that the smaller particles are attacked by the smaller grinding media. Roller mills are basically of two distinct types. The first has a series of rollers which rotate around a central axis within a drum. The reduction takes place between the rollers and the drum. The second type is where there are a series of fixed rollers and a rotating table. The milling takes place between the rollers and the table. This type of mill is used for dry grinding only and accepts only relatively soft materials. Small machines can have a throughput of only a few tens of kg per hour whereas larger machines are capable of handling up to 40 or 50 tons per hour and occasionally more. Feed size varies according to the machine. The machines are often fitted with screens for closed circuit grinding. Product size can be controlled by changing screens. The following are the mills used for very fine grinding. Hammer mills are high speed mills operating at speeds of between 2000 rpm and 6000 rpm. A set of ‘hammers’ rotate about a central axis in a vertical or horizontal plane. The hammers are either be fixed or are swinging freely. The whole system is enclosed in a cylindrical casing. Feed is dropped to mill from the top of the casing and the outlet for the product is usually via a screen which sieves the product and allows only the required size of particle to pass. The product size can be extremely fine, although an air classifier is required when such product size is required. Maximum capacity is of the order of 10 tons per hour and power consumption is relatively high. Rotating hammer mills are suited for the milling of softer materials. A pin mill comprises two discs, one rotating and one stationary which are fitted with intermeshing pins set in a concentric pattern. The charge is fed into the centre of the discs and is broken down as it moves outwards through the pins which are moving at very high speed (up to 20,000 rpm). The air classifying mill is similar in construction to the pin mill but incorporates a built in classifier. This type of mill produces a significant airflow through the machine to aid with keeping temperature as low as possible. Oversize materials, which pass through the mill, are usually recycled. Turbo mills use a similar concept but the rotating disc is fitted with paddles or bars rather than pins. This rotating disc sits within a cage which is fitted with grids, screens or breaker plates. The mill is configured in such a way as to produce the desired particle size. Pin mills are capable of very fine grinding without the need for screens and provide a uniform product size. Air classifying mills are used where the product is temperature sensitive. They are suitable for relatively soft materials and for small quantities of material. Wear on the pins is significant if used continuously. Vibratory mill does not rely on rotation for the main grinding action. The vibrating mill has a grinding chamber which is filled to around 65 % to 80 % of its capacity with grinding media such as balls or rods. The chamber is vibrated at a frequency of between 1000 and 1500 times per minute (can be variable speed) by cams or unbalanced weights. The grinding action is efficient and thorough. Grinding media material and chamber lining can vary depending on application. Vibrating mills are usually batch mills and can grind hard or soft materials. Maximum throughput is about 20 tons per hour. The feed size is normally kept fairly small. Although final product size can be as low as 0.005 mm, this type of mill is often used for less fine applications. Product size and shape is a function of the time spent in the mill, media type and size, and frequency of vibration. Stirred media mills are usually constructed in the form of a cylindrical drum inside which there are a series of rods, arms or perforated discs which are rotated on a central shaft. The drum is loaded with grinding media, such as metal balls or glass sand. The media and the charge is ‘stirred’ together and thus the grinding takes place. These mills are suited primarily for very fine grinding of soft materials. They are normally used with wet grinding but can also be used for dry grinding. Product size is as small as 0.005 mm. The general principle of operation in a fluid energy mill is that the material to be ground is fed into a grinding chamber in a high speed, high pressure and, often, high temperature jet of air (or other gas). The particles collide violently and this causes comminution to take place. Various designs of fluid energy mill exist, the most common being the micronizer. This mill has a shallow circular grinding chamber and a series of peripheral jets set tangentially to a common circle. The turbulence causes bombardment which effects a rapid reduction in particle size. A centrifugal classification system keeps larger particles within the chamber while allowing fine particles to leave. In a well designed fluid energy mill, there is usually almost no contact between the charge and the mill lining. These mills are suitable for hard or soft materials to be reduced to 0.02 mm or less. This method of milling tends to be energy intensive and slow but is suitable where the product is highly sensitive to heat or contamination from grinding media. Attrition mills are the most common type of mill and are the traditional mills for grain milling in many regions of the world. They are based on attrition grinding between two circular stones, one rotating and the other stationary. Plate mills use a similar principle but are constructed of steel or ceramic plates and used more commonly in the vertical plane. Output from such a mill is low and the mill in used only for small scale milling. The high pressure grinding rolls, often referred to as HPGRs or roller press, consists out of two rollers with the same dimensions, which are rotating against each other with the same circumferential speed. The special feeding of bulk material through a hopper leads to a material bed between the two rollers. The bearing units of one roller can move linearly and are pressed against the material bed by springs or hydraulic cylinders. The pressures in the material bed are greater than 50 MPa. In general, they achieve 100 to 300 MPa. By this the material bed is compacted to a solid volume portion of more than 80 %. Extreme pressure causes the particles inside of the compacted material bed to fracture into finer particles and also causes micro fracturing at the grain size level. Compared to ball mills, HPGRs are achieving a 30 % to 50 % lower specific energy consumption, although they are not as common as ball mills since they are a newer technology. Some of the characteristics and requirements to be considered when selecting a grinding mill are given below. Material properties – The choice of mill type is primarily dependent upon the properties of the material which is to be ground by it. It is vitally important to match the mill and material characteristics properly. Capacity – The scale of the operation determines the size of the mill which is required. Throughput or capacity is often given in tons per hour ( kg per hour for small mills). Reduction ratio and final size requirement. -This parameter decides whether a single mill is sufficient for final product requirements or if a multi stage grinding plant is be needed. Normally greater the reduction ratio, the larger is the likelihood for a multi stage process. Wet or dry product – Products which can be accepted in a wet state, such as slurries, can be milled wet which save power and reduce dust related problems. As a general rule, only tumbling mills are used for wet grinding, although other mills can be used for wet grinding in certain circumstances. Continuous or batch operation – Some mills can be designed in such a way as to enable continuous milling. This is important where the throughput is high, as well as making loading and emptying easier within the process. Some mills will only accept batch loads. Portable or stationary equipment required – Depending on the nature of the operation, the equipment can be installed permanently or can be portable. Portable equipment is useful for operations which move frequently to the dispersed sites. Classification – When considering a mill for a particular application, one needs to consider the classification mechanism that is needed for the process.